An oligotroph is an organism that thrives in an environment that offers very low levels of nutrients. They may be contrasted with copiotrophs, which prefer nutritionally rich environments. Oligotrophs are characterized by slow growth, low rates of metabolism, and generally low population density. Oligotrophic environments include deep oceanic sediments, caves, glacial and polar ice, deep subsurface soil, aquifers, ocean waters, and leached soils. An ecosystem or environment is said to be oligotrophic if it offers little to sustain life. The term is commonly utilized to describe environments of water, ice, air, rock or soil with very low nutrient levels. Oligotrophic environments are of special interest for alternative energy sources and survival strategies upon which life could rely. An example of oligotrophic bacterium are Caulobacter crescentus. 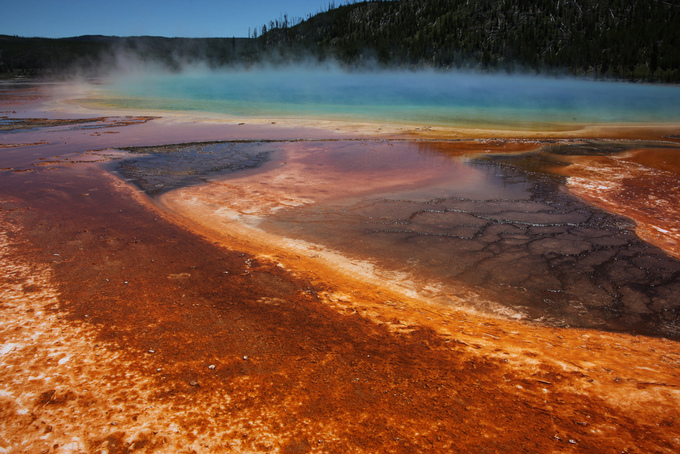 Extremophiles: These hot springs are an example of harsh environments that some extremophiles can grow in. Caulobacter crescentus is a Gram-negative, oligotrophic bacterium widely distributed in fresh water lakes and streams. The control circuitry that directs and paces Caulobacter cell cycle progression involves the entire cell operating as an integrated system. The control circuitry monitors the environment and the internal state of the cell, including the cell topology, as it orchestrates activation of cell cycle subsystems and Caulobacter crescentus asymmetric cell division. The proteins of the Caulobacter cell cycle control system and its internal organization are co-conserved across many alphaproteobacteria species, but there are great differences in the regulatory apparatus’ functionality and peripheral connectivity to other cellular subsystems from species to species. The Caulobacter cell cycle control system has been exquisitely optimized by evolutionary selection as a total system for robust operation in the face of internal stochastic noise and environmental uncertainty. The bacterial cell’s control system has a hierarchical organization. The signaling and the control subsystem interfaces with the environment by means of sensory modules largely located on the cell surface. The genetic network logic responds to signals received from the environment and from internal cell status sensors to adapt the cell to current conditions. Oligotrophic environments are of special interest for alternative energy sources and survival strategies upon which life could rely. oligotroph: An organism capable of living in an environment that offers very low levels of nutrients.